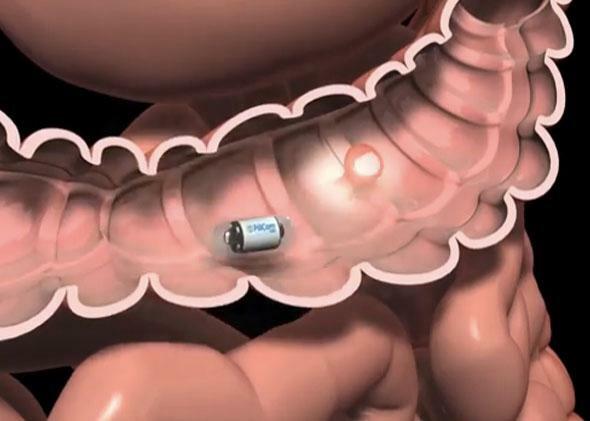 FDA Approval for PillCam could mean swallowing a pill instead of having a colonoscopy. Colonoscopies are unfortunately still king, but PillCam could replace them for people who are not physically able to undergo the more invasive procedure. Colonoscopies are the worst. Even if you’ve never had one, you’ve heard about them or watched someone go on a liquid diet to prepare for one and then you’ve heard about how awful it was. Ingesting a disposable pill-sized camera to take pictures of your intestines and colon sounds blissful in comparison. Which is why it was worth the 10+ year wait for the FDA to approve PillCam. PillCam COLON 2, from Israeli company Given Imaging, uses a battery to power two cameras that take high-speed photos over the course of an eight hour … journey. As it winds its way, the pill transmits the photos to a small receiver that the patient wears on his or her waist. When all of the photos have been collected, a doctor reviews them to spot polyps or other colon cancer warning signs. Unfortunately PillCam, which has been approved in 80 countries over the years, is only approved for patients who have problems undergoing normal colonoscopies because of colon disease, other surgeries, or concerns about their natural anatomy. People able to get a colonoscopy still need to because the images from the standard procedure are clearer than those taken with PillCam. With its current approval, PillCam will be an option for at least 750,000 patients a year and is projected to generate as much as $60 million in North America by 2019, according to the Associated Press. Doctors might even be able to use it as an alternative when patients absolutely refuse to have a colonoscopy. And PillCam costs far less than a colonoscopy: $500 versus $4,000 for the traditional procedure. But Debbie Wang, an analyst at the investment research company MorningStar, told AP that this price differential makes the situation delicate. “Given’s management understands that the traditional colonoscopy is the gastroenterologist’s bread and butter right now, so they didn’t want to do anything that would position this as a substitute,” she said. Though it may not signal the end of colonoscopies yet, the difference in price and comfort will hopefully mean that patients heavily favor PillCam when possible. If there is enough incentive to improve the imaging technology so it is on par with colonoscopies, the dreaded procedure could be … eliminated.